Recordings from our free webinar series that you can watch anytime, on demand and share the insights you gain with your colleagues! To access these webinars on demand, simply click on the link below each session. You will need to provide your name and email address to watch this recording. We will also add you to our mailing list (if you aren’t already on it!) so you receive Worklogic news, invitations and insights on how to manage workplace conflict and build a positive culture at work direct to your inbox. 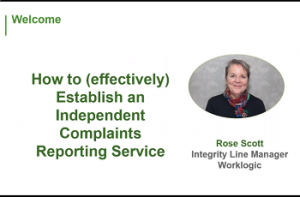 In this webinar, Integrity Line and Policy Development Manager, Rose Scott explains how to establish an independent complaints reporting service. She addresses common concerns (e.g. ‘we will drown in a deluge of complaints!’) and shares what to do (and what not to do!) drawing on Worklogic’s extensive experience in this space. 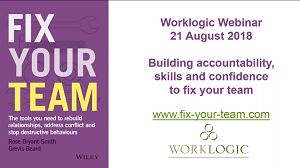 Worklogic co-founder, Rose Bryant-Smith, discusses common situations where power imbalance can go wrong in the workplace and the strategies you need to implement in order to drive change and prevent re-occurance. 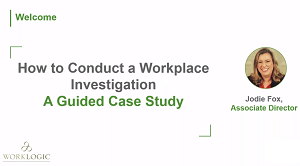 In this webinar, Jodie Fox takes you on a guided journey on how to conduct a workplace investigation. Using a real-life example and drawing on her extensive experience, Jodie walks you through the steps required to conduct a fair and effective workplace investigation. She also points out the traps to avoid along the way! Walking the talk (values); Having difficult conversations; and Ensuring clarity. build buy-in from your peers and managers to implement the fix. There are numerous tools you can employ to help manage workplace conflict, but what is the best tool for each situation? 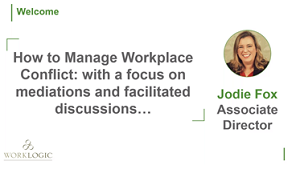 Watch Jodie Fox, Associate Director, as she discusses the difference between mediations, facilitated discussions and workshops and how they can help manage conflict in your workplace. Key ways to create an accountable and ethical culture. 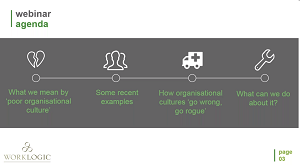 Join Rose Bryant-Smith, Co-Founder and Director, as she discusses what can be learnt from recent organisational culture failures in this webinar on demand. 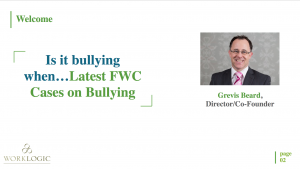 Whilst sometimes bullying matters can be straightforward, recent decisions by the Fair Work Commission have clarified, expanded and challenged our understanding of what is bullying behaviour. Join Grevis Beard, Co-Founder and Director, as he discusses some scenarios and explains whether the behaviour can be described as bullying. Happy and engaged workplaces increase staff satisfaction and productivity, whilst minimising turnover. 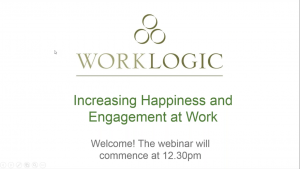 Join Rose Bryant-Smith, Co-Founder and Director, as she discusses how you can improve your workplace to be more harmonious and engaged. 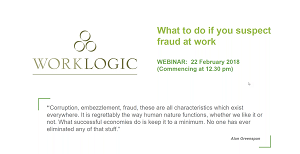 Worklogic Associate Director, Jason Clark, provides practical advice on what to do when you suspect fraud might be occurring in your workplace. 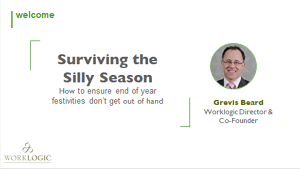 Worklogic Co-founder and Director Grevis Beard discusses the best way to navigate silly season so that all of your employees can have a safe and relaxing end to the year. Performance management conversations can be fraught with danger and can be particularly stressful for both parties involved. 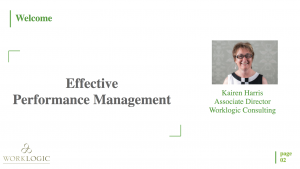 Kairen Harris, Associate Director, discusses the best way to approach performance management conversations so that you can have a constructive dialogue with your employees. Are you dealing with staff who are engaged in destructive conflict? 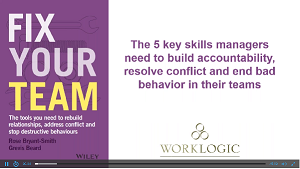 Do you want to improve your team’s conflict management competency? Conflict coaching is an effective, low risk early intervention strategy. 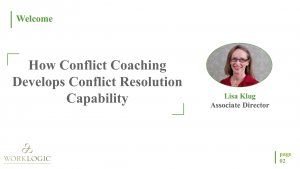 Lisa Klug, Associate Director, explores how conflict coaching develops organisational and individual conflict resolution capability, while addressing workplace conflicts early, and eliminating risks that the conflict will escalate to a dispute. 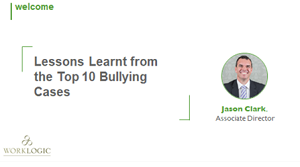 Associate Director, Jason Clark, reviews the the top 10 bullying cases of the last few years and explains the important lessons which can learnt from them. 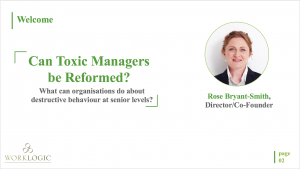 Worklogic Co-Founder and Director Rose Bryant-Smith discusses strategies organisations can deploy to address toxic behaviour at senior levels in an organisation. 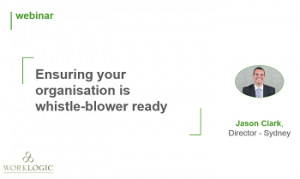 View this engaging webinar to learn the five steps to increase the accountability of senior people for the impact of their bad behaviour on the organisation. Worklogic Co-Founder and Director Grevis Beard explores how and why the recent cases of sexual harassment have a bullying element to them, and what it means for your workplace culture and people risk. 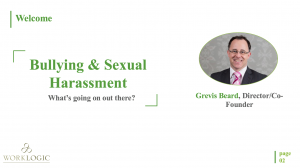 View this engaging 30-minute webinar and walk away with a better understanding of recent cases where there has been cross-over between bullying and sexual harassment behaviours, the dynamics which can make workplaces prone to such behaviours and what steps you need to take, or further finesse, to minimise the risk of such behaviours arising. Worklogic Co-founder and Director, Rose Bryant-Smith explores the importance of proactively gathering employee feedback and concerns, so you can address issues before they become formal complaints. View this informative 30-minute webinar and learn about the seven key tools that you can deploy in your organisation to encourage feedback – and what to do once you have received it! Keen to manage people risk? Want your business to be on the front foot and working on those issues that matter most to employees? Believe that staff can help shape the business agenda? 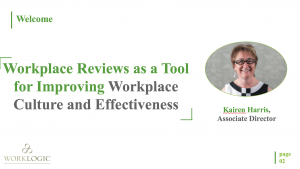 Discover the different ways to conduct successful workplace reviews in this Worklogic webinar on demand, presented by Kairen Harris, Associate Director, Worklogic and former GM HR. 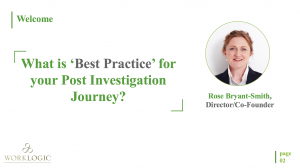 What is ‘best practice’ for your post investigation journey? “Where to from here” ? Tips and trends, and take homes. 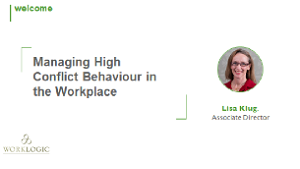 Associate Director, Lisa Klug explains how to recognise, understand and deal with high conflict behaviour in the workplace.